This weeks tip is about dry shampoo. 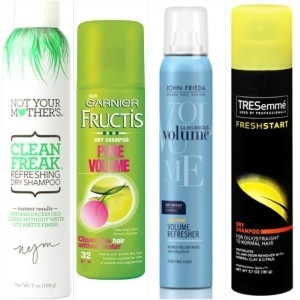 I think that some people don’t know it, but dry shampoo should be your friend. Or you have amazing hair that you don’t have to wash every day, then you won’t need it. Almost everyone has an issue with their hair. Some think their hair is to flat or to curly, to blonde or to brunette or another color or some sort of consistency. But a lot of people wash their hair on a daily basis, wich is not so good for your hair. When you wash your hair daily you destroy the rhythm of the natural sebum production wich makes your hair even more quickly greasy. Therefor it is interesting to use dry shampoo when your hair is greasy but you don’t want to (or don’t need to) wash it. Your hair won’t look greasy and it gives you a bit of extra volume. So the best thing to do is to wash your hair every two days with normal shampoo, and the other day you use dry shampoo. That way your hair always looks good and it is more healthy for your hair. This entry was posted in beauty and tagged beauty, dry shampoo, tips by missnathaliexo. Bookmark the permalink.